A new study reveals the recent widespread die-off of starfish — linked to climate change, warming oceans and a disease epidemic — imperils the biggest starfish of all, the sunflower star. Once a common delight of every beachcomber, sunflower starfish — the large, multi-armed starfish sometimes seen underwater at the near shore — are imperiled by disease and ocean warming along the West Coast. The devastation occurred over just a few years and even affected starfish in deeper water, according to research co-led by the University of California, Davis, and Cornell University published in the journal Science Advances. 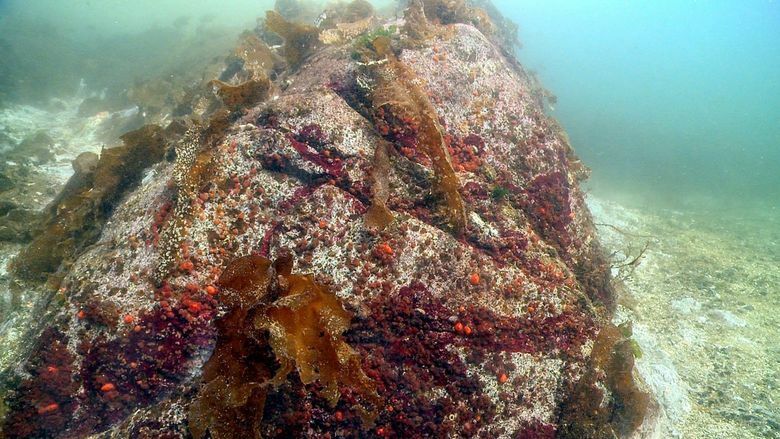 At one time plentiful, the sea suns, or sunflower starfish, right now cannot be found off the California coast and are rare northward into Alaska, said Drew Harvell, the paper’s co-author and Cornell professor of ecology and evolutionary biology. The starfish have become so rare over the past three years the scientists consider them endangered in the southern part of their range. Sea star wasting disease beginning in 2013 caused a massive die-off of starfish of multiple species, from Mexico to Alaska. Hideous to behold, the disease causes starfish to fall apart, with pieces of their arms walking away, or their bodies disintegrating on pilings, beaches, rocks and the seafloor. The disease also has affected starfish on shores from New Jersey to New England. The sunflower star continues to decline, even in the deepest ocean, and is not recovering like some other species, such as the ochre star. Starfish matter in the ocean — and not only because they are every kid’s first friend on the beach. Sunflower stars in particular prey voraciously on sea urchins — which keeps urchin grazing on kelp forests in check. As sunflower stars crash, urchins surge — and mow down kelp forests. That reduces the waving, green underwater nurseries that young fish need to thrive. Sunflower stars are the lions of the subtidal zone, big as a manhole cover and with mighty appetites. 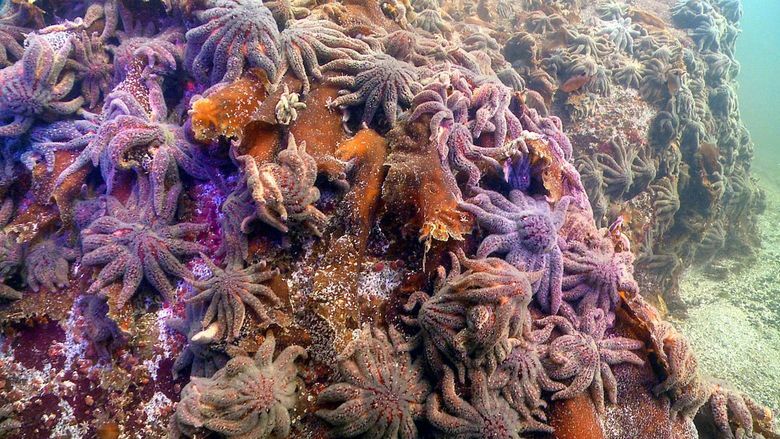 That is why losing sunflower stars threatens the biodiversity they nurture, said Joe Gaydos, another author on the paper and science director at the SeaDoc Society. “The cascading effect has a really big impact,” Gaydos said. The crash in sunflower starfish corresponds with ocean warming by up to 4 degrees Celsius that started in 2014. Trawl surveys from Mexico to the Canadian border recorded a total wipeout of sunflower starfish in all states, and in deep water down to 1,000 meters. 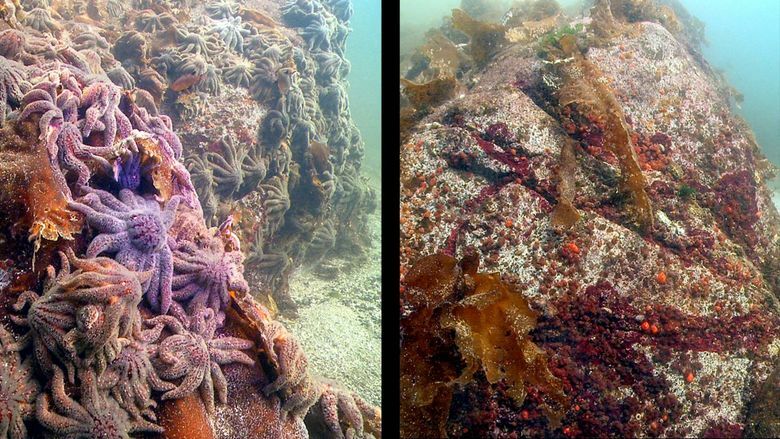 Because they live underwater and are not often seen from shore, the sunflower starfish crash has gone unnoticed by comparison with the dripping, oozing horror of the ochre stars on display at every Puget Sound beach and beyond. Harvell agreed. “A warmer world is a sicker world,” she said.